Lock in a great price for Holiday Inn Manchester-Mediacityuk – rated 8.9 by recent guests! Excellent location, close to shops, tram stops outside, friendly staff. Room was nice, very quiet and temperature was good. Excellent breakfast. Wide choice well prepared. Very comfortable bed. Friendly staff. Good service. Jodie the manager and Ruth the one who booked us were both really nice. We had some ques and Jodie made sure we were happy with the ans before leaving. I stayed for one night. The room was clean, comfortable and very lovely. The staff was friendly and the check in and check out very quickly. The location was good 20 minutes walk to Old Trafford stadium. very comfortable room good choice at breakfast. bed very comfortable air con was a bonus the hotel is very convenient if your want to visit the bbc studios or the coronation street set. Friendly staff and a really nice room with a desk. Holiday Inn Manchester-Mediacityuk This rating is a reflection of how the property compares to the industry standard when it comes to price, facilities and services available. It's based on a self-evaluation by the property. Use this rating to help choose your stay! One of our top picks in Manchester.With free Wi-Fi and a stylish restaurant, Holiday Inn Manchester-Mediacityuk is just 10 minutes’ drive from Manchester center. BBC Manchester is a 1-minute walk away. Located in Salford Quays, this new hotel has modern rooms with air conditioning. Marco Pierre White's New York Italian restaurant serves authentic Italian dishes and New York favorites. The restaurant serves a varied menu throughout the day, into the evening. The lively Hub Bar offers morning coffee, light lunches and a large selection of beverages and wines. Located at Media City, the largest purpose-built media community in Europe, Holiday Inn Media City is a 10-minute drive from Old Trafford and Manchester United Football Club. When would you like to stay at Holiday Inn Manchester-Mediacityuk? This air-conditioned room features a TV with cable channels, free Wi-Fi and tea/coffee-making facilities. Located on the 16th-floor, these rooms have impressive views, executive toiletries, bathrobes, slippers and a rain shower. Includes free mineral water and chocolate. This air-conditioned room features a TV with cable channels, free Wi-Fi and tea/coffee making facilities. These rooms also have an accessible private bathroom. This air-conditioned room features a TV with cable channels, free Wi-Fi and tea/coffee making facilities. Please request double or twin beds when booking. Please note that this is not guaranteed and is subject to availability. We look forward to welcoming you to the Holiday Inn MediaCityUK. 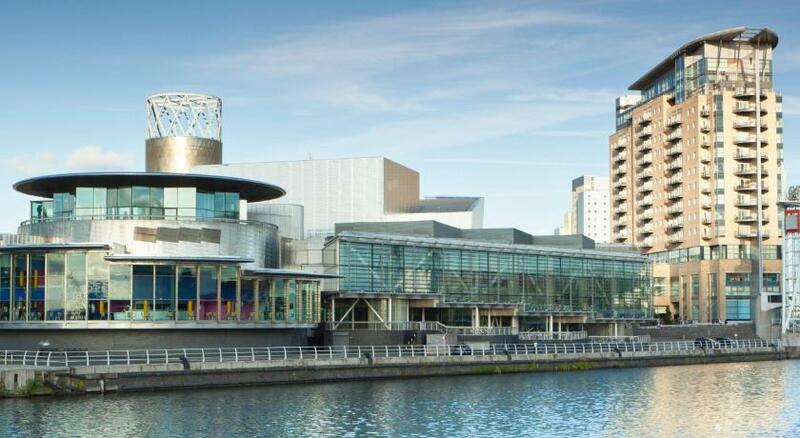 Based in the heart of MediaCity, we have been open since October 2010. House Rules Holiday Inn Manchester-Mediacityuk takes special requests – add in the next step! Holiday Inn Manchester-Mediacityuk accepts these cards and reserves the right to temporarily hold an amount prior to arrival. Please note that only card payments are accepted at the hotel. Payment for all reservations will be taken on the morning of arrival. Please note that the original card used for booking must be presented on check-in. A pre-authorization for the total stay plus GBP 50 will be taken on arrival from the valid payment card that was used to make the booking. Please note that reservations for Marco Pierre White's New York Italian Restaurant must be made in advance. The car park height restriction is 6.2 feet (6’2 feet). An alternative pay and display car park is located in front of the hotel. The temperature of the room was tricky to moderate. Hot and stuffy one minute and very chilly the next. The device on the wall was not easy to use. Shower and bathroom were very nice, cosy and clean. Room was comfortable and clean. Bed was a little soft for me. Very friendly and helpful staff. Lovely room. Good breakfast. The little things that make a big difference were well thought through. Plenty of mirrors near plug sockets. Fridge near kettle etc. Very good and nice location. We stayed here for the easy walking distance to the Manchester marathon and got way more than we expected. We loved the area with restaurants and lovely walking by the water. The room was great, very clean and comfortable and a view across Manchester. We really enjoyed our stay.